I finally got around to moving my blog to GNOME infrastructure. It can now be found here. Application sandboxing is a subject that I am passionate about. In recent months I have been involved in a design initiative to plan out how sandboxed applications would work on GNOME, and I gave a talk on this subject at GNOME.Asia early this year, and I’ve been meaning to blog about it ever since. There’s quite a lot to be said about sandboxed applications, so this is the first of two posts on the subject. In this post, I want to talk about why application sandboxing is important, and it importance across a range of areas. The second post will deal with the actual user experience of using a sandboxed application. Only has access to a limited set of system API. Has managed access to additional system API and to user data – so that the application must ask permission for access. Can be effectively tracked and managed by the host operating system as it runs. Can be installed and updated independently of the host operating system – new dependencies are not required, and the operating system components do not need to be updated. Can include any dependencies that are not provided by the operating system. There are two related aspects to this definition: the first is application distribution, installation and update. The second is a privacy and security framework. Sandboxed applications are containerised, and those containers can include bundled libraries. They have only limited access to the underlying system, and they must ask for user permission to use certain hardware devices (like cameras, microphones or GPS), or to access user data. I genuinely think that application sandboxing represents the future for the GNOME project. We have never had a rigourous definition of what an application actually is in the GNOME world. That has led to all kinds of negative consequences, both in terms of the user experience that we provide, and the ability for developers to distribute applications. Conversely, sandboxing infrastructure for GNOME promises to have all kinds of positive consequences. The following are what I consider to be the most important consequences of application sandboxing. Security and privacy, I think, are core beliefs for Free Software. Users should be able to trust us to have their interests at heart, and should be able to have more faith in our products than proprietary alternatives. Ironically, though, the Free Software desktop world hasn’t done a great job at security. It is actually pretty scary what a malicious desktop application could do if it wants to. We rely on transparency and good faith to ensure that applications do not infringe on user privacy, rather than robust technical architecture. If we want to be able to make a strong case for the value of Free Software desktops, we need to be able to make serious claims about the robustness of our security and privacy features. It is time to stand up for what we believe in, and to make our technologies reflect our beliefs and commitments. Otherwise, it is quite difficult for us to tell a coherent story about why we or our products matter. Sandboxed applications are an essential part of an effective, easy-to-use application development platform. By definition, a sandboxed application has access to less API than one that isn’t sandboxed. This is actually a good thing – it makes it clear to application developers which API is supported by the platform. It gives them less to deal with, and reduces uncertainty about how they should implement their application. It is also easier for us to develop our application development platform if it works through sandboxing – since we will have a clearer, more tightly defined set of platform functionality to worry about. Sandboxing makes it easier to look at the platform as a whole and identify missing functionality, or functionality that can be improved. This is an important issue for application developers, as well as the GNOME application ecosystem. Right now it is far too difficult for developers to get their applications into the hands of users. Application distribution is fragmented, slow, and fraught with organisational hurdles. An application development platform built on sandboxing and containerisation will provide a stable base which application authors can target. This will allow application authors to target specific versions of the platform, to easily distribute and update their applications, and to have greater confidence in how their application will look and perform in the hands of users. It will make it easier for developers to independently distribute their applications, should they want to. The primary purpose of any operating system is to host applications. While there are certain additional features that these operating systems need to provide, wherever possible, the base operating system should be as minimal as possible, and only provide functionality that is needed by the applications it hosts. Right now, we don’t have a clearly defined set of API that is exposed to applications. As a result, it becomes rather difficult to decide which functionality a desktop operating system should provide and, without a clearly defined application platform, we lack the ability to rigorously define what functionality and components the host operating system should include. Application sandboxing helps with this problem of operating system definition. The API that is exposed to applications becomes the primary reference point for determining which components should make up the operating system. Addressing this issue of OS definition has a number of other beneficial consequences: once you can clearly define an operating system, testing becomes a lot easier. Writing documentation gets easier. Providing support gets easier. Application sandboxing and containerisation enables a far superior user experience. I’ve already alluded to some of the ways that it does this – protecting privacy is a user experience issue, for example. Likewise, application installation and update also have user experience consequences. There are other ways that sandboxing helps to improve user experience though. It ensures that applications behave consistently, as well as preventing them from misbehaving. It also enables the operating system to effectively manage system resources. Applications that are running in the background can be throttled to ensure that the system and whatever you are interacting with remains fast and responsive. Power management can be improved. Network bandwidth can be portioned out more effectively. Enabling the operating system to effectively manage applications is a key way that we can make the user experience consistent, smooth, and predictable. It is 2014. Your system should not be laggy and slow because some application is chewing up all your CPU. Sounds rather good, doesn’t it? Application definition, integration and management is a fundamental aspect of defining an operating system, a user experience, and an application development platform. As a result, application sandboxing promises to have positive effects across a wide range of areas. I hope that this post has illustrated where application sandboxing will have a positive impact, and why it is so important. 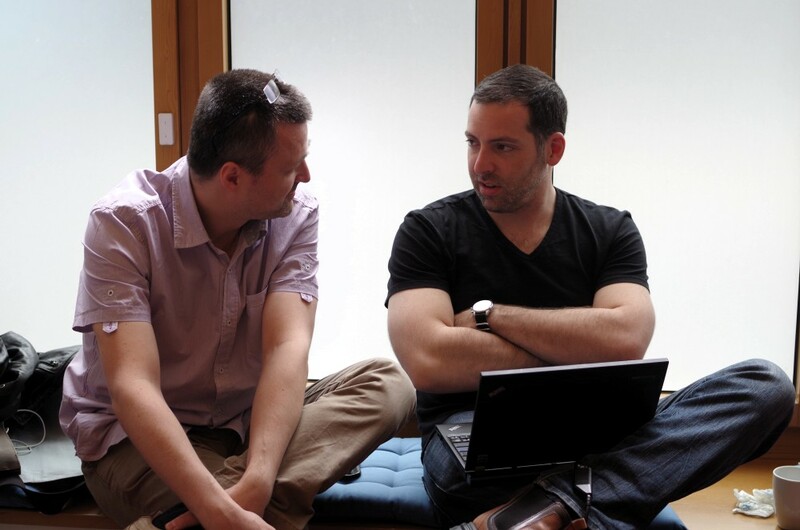 In the GNOME project, we have been discussing and planning how sandboxed applications could work for some time. Several major technical initiatives – like Wayland and KDBus – are now reaching a stage where they can provide the necessary infrastracture for us to make them a reality. As Christian has posted today, concrete plans now exist for the next stage of development. In my next post on this subject, I will describe the user experience design that Jon, Jakub and me have been working on in this area. This should give a better idea of what it will be like to use a sandboxed application. It should also give an idea of the outstanding work necessary to make them a reality. 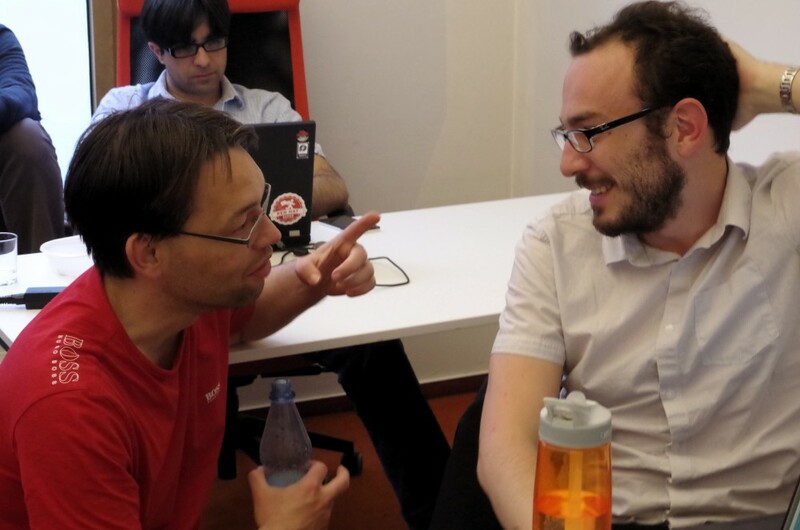 At the beginning of this year, Jon was contacted by someone who was interested in doing user testing on GNOME. This person said that he wanted to promote usability in open source software, and had research experience. His name was Jim Hall. The best thing about working with Jim has been how keen he has been to work us in the GNOME project throughout the research process. We were able to tell him about the kinds of things we were interested in for user testing, were able to give feedback and comments on his test plans, and were able to discuss his results with him shortly after the tests were conducted. This kind of direct access to the research process was fantastic, and ensured that the tests were relevant to our ongoing work. Jim will be presenting his test results at GUADEC next month. 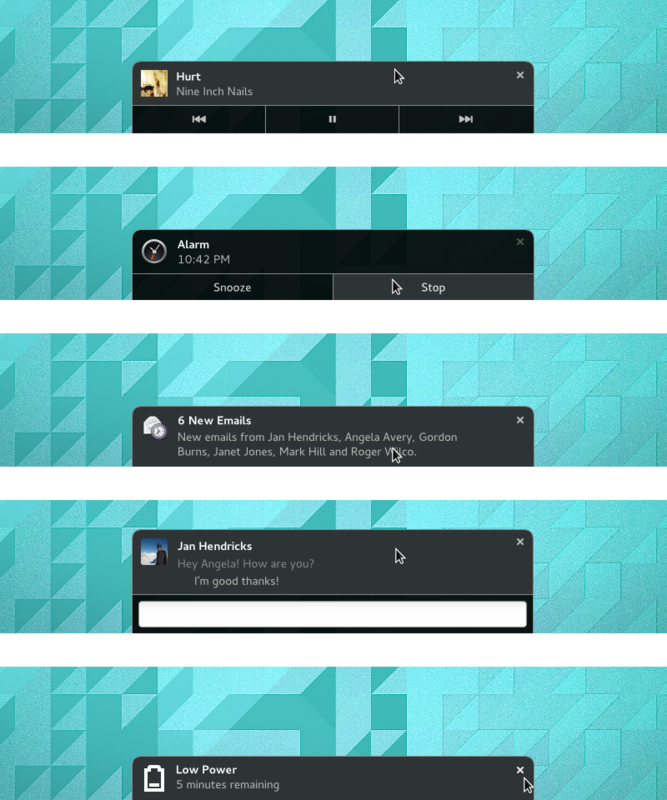 A couple of weeks ago I posted about ongoing work to redesign notifications in GNOME 3. Since then, the redesign has moved on a fair bit, so I thought that an update was in order. My previous post also generated a fair amount comment, and I’ve been wanting to respond to the questions and comments we received. Previously, I described a work-in-progress design that we have been pursuing in GNOME design. Since that post, the process has diversified, and we are exploring several variations on the original design. These different options are in a state of evolution, and we are developing and evaluating them in parallel. To help with this, Jasper has created a couple of rough prototypes that we’ve been testing. I’m not going to go into the details of these different designs here – they’re in a state of flux, and it would take a fair amount of time and effort to go through each one. However, if you are interested, there’s plenty of activity in the usual places: check out the wiki, our mockups repository, or hang out on the #gnome-design or #gnome-shell IRC channels (note that details are necessarily incomplete as the design is in a state of flux). Each of the designs we are considering have some basic things in common, like using a time ordered list for the Message Tray. They also share some goals, like simplifying the UI and code base. This has meant that the design project has been able to move forward in some areas, and our plans for the technical architecture have been moving forward. I read every comment that is made on my blog, as well as the responses I get on social media. Since there was a fair amount of feedback on my last post, I wanted to take the time to respond in a more structured manner than usual. A number of people raised privacy concerns about displaying notifications on the lock screen. This was largely the result of a misunderstanding (my fault! ): the mockup I posted in my previous post featured detailed notification banners on the lock screen, and this led people to think that this was going to be a feature of the new design. The current behaviour is to show notifications on the lock screen, but to only indicate the application which sent the notification – we don’t include the content of notifications on the lock screen by default. The new design didn’t involve us changing this policy, even though the mockup alone suggested otherwise. That said, the comments about this did prompt us to re-examine how the current lock screen notifications design performs when notification content isn’t displayed, and we might well make some changes here. The comments contained multiple reports of the existing toaster-style notifications getting in the way of what users are doing in applications. This was observed to be a particular issue when using chat clients, IRC or terminals. We’ve been aware of this issue for some time, and it is something that we’ve attempted to resolve in the past. The designs that I presented last time around didn’t fix the issue, and one of the reasons why we’ve made the decision to investigate other options is to see if we can do better. It should be noted that most notification systems involve popups appearing over applications, and an alternative design will likely have its own quirks. This is something we need to take seriously when considering major design changes. A number of people told us that they miss notifications with the existing GNOME 3 notifications, and this observation often prompted the suggestion that the new notifications design should include a permanent visual indication of pending notifications. The issue of missed notifications is definitely an important factor that we are attempting to address, by changing the position, size and timing of notification banners. We are also hoping to introduce a priority setting for notifications, so that more important popups (like for chat messages) can be made more noticable. We are also considering an indicator for pending or missed notifications as a part of the design. What about the top bar? There were various requests that the top bar should be used for notifications. This is a complex question that touches on a fundamental part of the notifications design: if you give notifications a presence in the top bar, it is my view that notification banners need to be located in the same area of the screen, and this raises a whole other set of issues and questions. GNOME 3 has historically had its notifications at the bottom of the screen (I mentioned some reasons for this in my previous post): it allowed notification banners to be expanded so that actions could be taken on them. 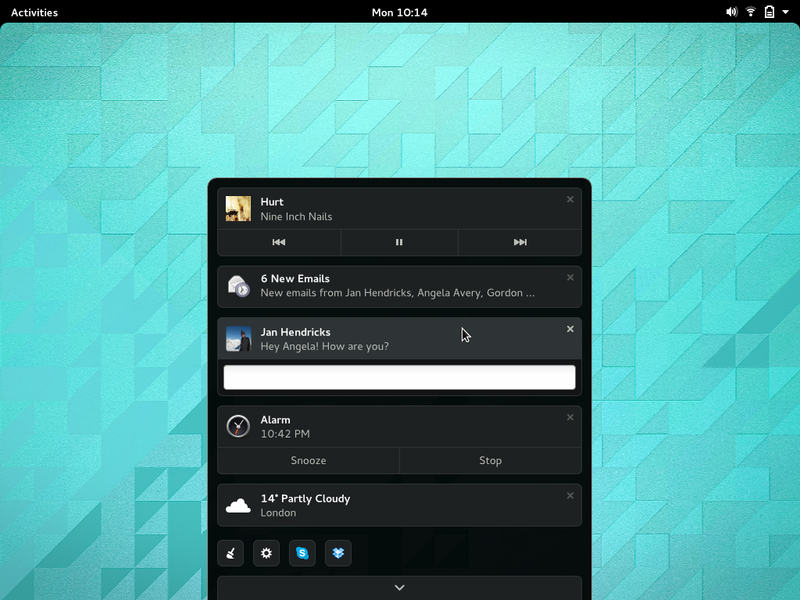 In particular, this arrangement was designed to facilitate the chat integration features we see in GNOME 3 today. Having a way to access notifications from the top bar would have a number of advantages. It would give you a discoverable click target, and the top screen edge has ergonomic advantages. It would also locate notifications amongst other system functionality. However, it would be a big change, which would require an even bigger redesign than the one I have already described. Nevertheless, it is something that we’re seriously looking at. Status icons are another outstanding issue that we received feedback about. There are known interaction issues associated with them in GNOME 3, and this is something that we want to resolve. One of the major issues here is the problematic nature of the status icon API – if we are going to deal with the problem properly, we need to establish a new API and give applications time to port over to it. We are currently working on a plan for this. Notifications are complex, and we are taking the time to make sure that any design changes that we make are a genuine improvement. As I mentioned, we are currently working with a number of designs. Once we’ve developed one of them to a state where we are happy with it, I’ll try to post another update with details. Over the past several GNOME releases, we have been aiming to stabilise GNOME Shell as much as possible. We have been largely successful in this: the last major UI change was in 3.10, when we introduced the combined system status area, and the main improvements in the recent 3.12 release were for performance and bug fixing. This is a good thing. At the same time, there is one area where a number of us still feel that bigger changes are needed. This is notifications, particularly the Message Tray. In this post, I’m going to present a new set of designs for notifications and the Message Tray, which we’re hoping to implement for the next GNOME release. As ever, these aren’t set in stone and are in a state of evolution. The aim of publicising the designs is to get feedback so we can improve them. The original notifications design for GNOME 3 was introduced with 3.0. 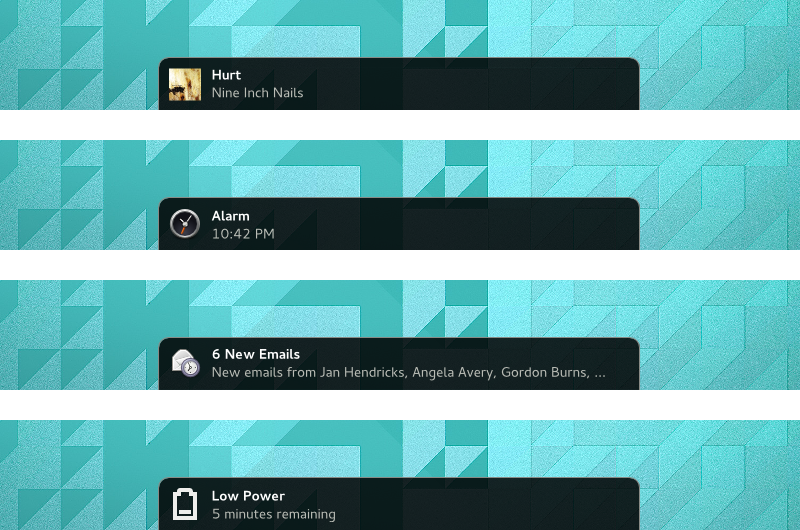 One of the main features of that design was being able to take actions directly from notifications. There was also an emphasis on integrated chat – you could reply to messages directly from a notification, and you could (and still can) see your conversations in the Message Tray and post to them from there. This feature influenced the basic design of the tray, which was structured as a set of “message sources” that you can interact with from the bottom of the screen. The layout of the tray as a strip of icons means that it doesn’t communicate a lot of information when it is first opened. It also makes it hard work to use, since each notification source has to be individually opened to get more information. The tray is too difficult to open with a pointer, as it requires a lot of downward pressure against the bottom screen-edge. There isn’t a way to quickly see how many notifications are in the tray, and there’s no reminder provided about waiting notifications. Addressing these issues requires that we rethink the overall design of the Message Tray. This is also an opportunity to address a range of smaller interaction issues with the existing design. 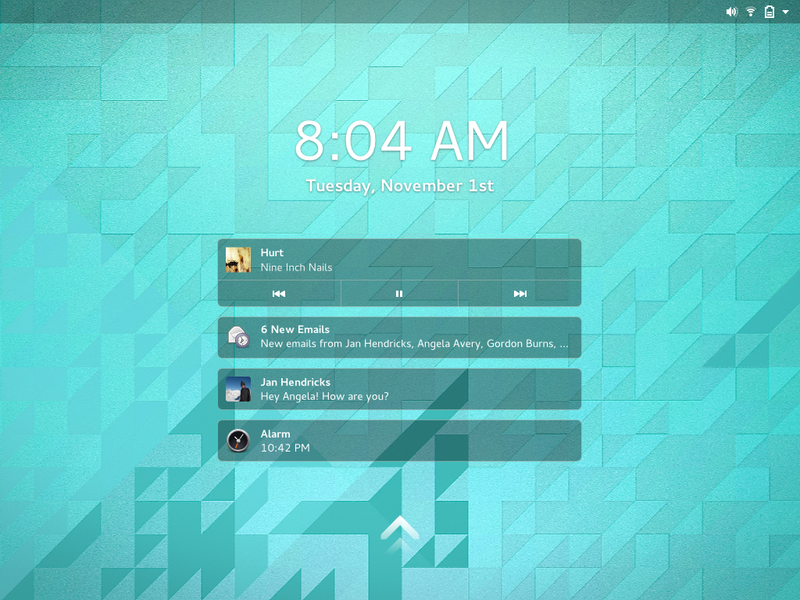 This said, the original vision for notifications in GNOME 3 has some very positive aspects, which we want to preserve. Being able to directly act on notifications is a powerful feature, for example. The combination of a minimal message banner (the initial notification popup) which can be expanded is also good, as is the concept of having a tray where outstanding notifications can be viewed and interacted with. Be immediately useful. We want the tray to instantly provide useful information, and we want it to be possible to act on notifications straight away. Make use of physical affordances. In particular, we want to make greater use of the screen edge when using the pointer. This should make interacting with notifications and the tray easier. Sequential ordering. Notifications occur in time. Reflecting this in the layout of the Message Tray means that it will provide a more accurate representation of your notifications. Advertise interactivity. Some interactive parts of the existing design often haven’t been noticed. We’ll be making these much more obvious with the new design. Consistency and simplification. The existing design has been a bit burdened by its complexity, particularly because notifications are organised into different message sources. With the new design, we are pushing to simplify the design as much as possible. This should help to reduce the number of bugs, as well as improve usability, since we are aiming to ensure that notifications have a consistent appearance and layout. The final goal is one that was at the core of the original design, and which is central to the design of GNOME 3 as a whole: that is, to be noticable and useful without being distracting. Wherever possible with GNOME 3, we have tried to produce a distraction-free experience which helps you concentrate on the task in hand. This requires a fine balancing act, which can be tricky to get right. With the new designs, we want to change that balance slightly, by making notifications a bit more noticable and by providing more effective reminders, but we still want to retain the emphasis on avoiding distraction. The new design that we’re hoping to implement for GNOME 3.14 has been evolving for a while. There’s been a lot of experimentation in the design space, and quite a few concepts have been evaluated and thrown out. The design that is described below is the current state of that process. Since notifications can be quite complex, there are a lot of details involved. If you’re interested, there is plenty of information on the wiki. The most striking change with the new design is the introduction of a completely new Message Tray. The previous Message Tray design presented message sources as a set of icons in a strip along the bottom of the screen. With the new design, the tray contains a list of notifications, and slides up from the same bottom screen edge. This allows simplification, since the notifications are no longer reorganised into a set of message sources. The list is time-ordered, reflecting their sequential nature. It is also immediately useful, since you can see information about each notification straight away. The new design also changes the way that the tray is opened. Hovering or pushing on the screen edge will cause the tray to peek up, along with an indication of the number of notifications in the tray. Clicking the visible portion of the tray will cause it to open and a second click will cause it to hide again. The peeking tray, along with the notification count, will always be visible in the Activities Overview, in order to provide a reminding function. This aspect of the design is intended to provide a quick way to check if you have missed any notifications, as well as to quickly inspect the contents of the tray itself. We also want to make the action of opening the tray much easier than it is now. One of the primary goals of the lock screen was to show missed notifications when you return to the computer. Designs for expanding the role of lock screen notifications have existed for some time, particularly with regards to being able to activate notifications from the lock screen. I’m not sure whether we’ll get chance to implement this aspect of the design for 3.14, but it should be said that the new design makes an effort to make the Lock Screen and Message Tray notifications as consistent as possible. The existing formula for notification banners remains the same with the new design. Some aspects of the layout have changed, however: this enables them to have a consistent layout, irrespective of whether they are presented as a popup, are in the Message Tray, or are on the Lock Screen. The banners are bigger, which makes them more noticable. Expanded banners also remain fundamentally the same, albeit with a modified layout. Buttons are now flush against the screen edge, making them easier to target with a pointer. We also plan to use hover states more readily, in order to communicate interactivity. Everything I have presented here is currently being treated as experimental. Jasper has an initial implementation in the works, which we are already testing, and are going to continue evaluating as it is developed. As usual, the design might change as we try things out, and we’ll only merge this into 3.14 if and when we feel that it is worthwhile. You can help us to develop the designs with your questions, comments and feedback. I just got back from a great trip to Beijing, for GNOME.Asia 2014. This was my fourth GNOME.Asia, and I’ve been to every event since 2011 in Bangalore, where I participated in the GNOME 3.0 hackfest. It was great to meet up with the GNOME.Asia crew once again. They’re a fantastic bunch, and it’s always a pleasure to meet friends from Asia. Photos from the event can be found on Flickr. This year’s GNOME.Asia was co-hosted with FUDCon APAC. Combining the conference with another event worked really well, in my opinion, and helped to boost participation and share the organisation workload. This could be an effective formula for future events. On the Saturday I gave a talk about sandboxed applications for GNOME. This is something I’ve been working on recently (I’ll blog about it soon, I hope), and I think it’s an important topic, so it was good to get the word out. In general, I thought that the talk went pretty well, and it was a good opportunity to present our plans to Lennart Poettering and Kay Sievers. Highlights from the conference included Lennart’s keynote on systemd and David King’s talk on GNOME 3 application development. We ended the conference with a really nice discussion about the GNOME Foundation. It was great to see so much interest in how GNOME operates. Many thanks to the GNOME Foundation for sponsoring me to attend this event. I’d also really like to thank the conference sponsors. 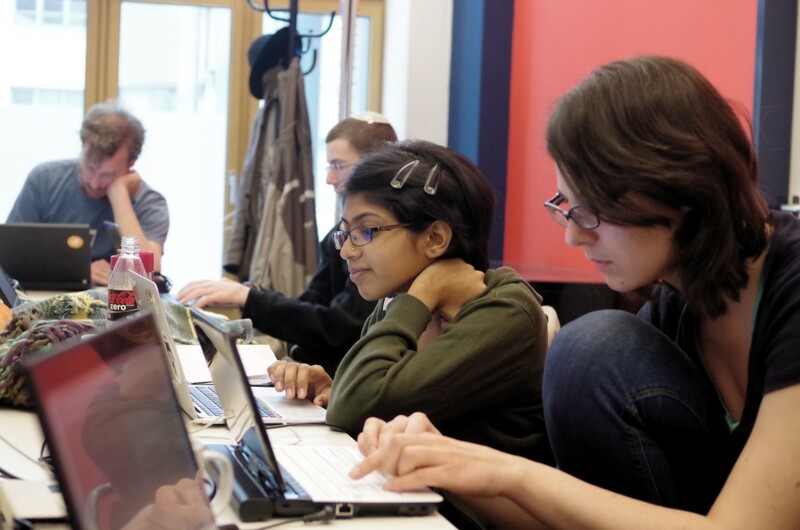 Last week I participated in the 2014 Developer Experience Hackfest. It was a great event – it’s so useful to spend time focusing on this important area, and it was an invaluable opportunity to move existing work forward and agree on plans. We should definitely ensure that we have a developer experience event every year. My personal priority for the event was to plan the future of GTK+, particularly so that it supports the GNOME 3 application designs we have. We have come a long way in this area, but there are a few outstanding design patterns that aren’t fully supported by the toolkit. Adding support for these will not only make it easy for people to create GNOME 3 style applications, but it will also enable us to publish a new version of the HIG. 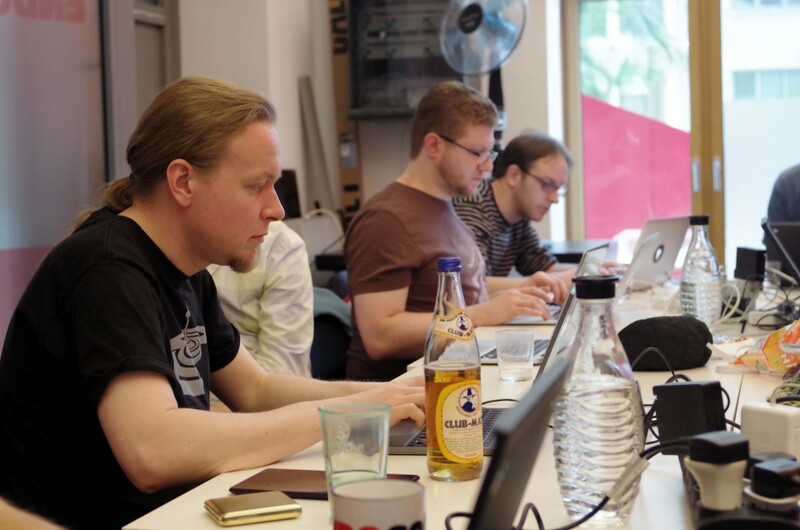 During the hackfest we spent an afternoon reviewing GTK+ support for the various application designs we have, and identified the priority items that we need to take care of. We seem to have a clear plan in this area now (more details on this to come). I’m really happy that people have signed up to work on the most important tasks. Hopefully we will have support for all the key application design patterns in the not too distant future, which will enable an initial version of a GNOME 3 HIG to be published. Another area I spent a bit of time on during the hackfest was developer documentation. I worked with Kat and Dave to clean up the material on developer.gnome.org, and I did a bit of tidying of the platform overview. This work should tie in with the advances we’re making on API reference documentation. I’d like to say a big thank you to Chris Kühl and Endocode for hosting the hackfest. They have a great space, and were very hospitable hosts. Many thanks also to the GNOME Foundation for sponsoring the event – many of the participants would not have been able to attend without this support.